Left: Original annular 360 degree Omniramic (TM) image captured with a hand held camera and an early prototype wide angle reflector that was the predecessor to patented and and patent pending Versacorp Omnirama (TM) Axial Strut Wide Angle Optical technology. Right: The same image, converted to a rectangular format with Adobe Photoshop's "Polar Coordinates" filter, then scaled in one dimension to normalize proportions. A portion of one end of the panorama was spliced to the other in order to provide overlap. © Copyright 1997 Jeffrey R. Charles, All Rights Reserved. 240 degree interior panorama having 130 degrees of vertical coverage. 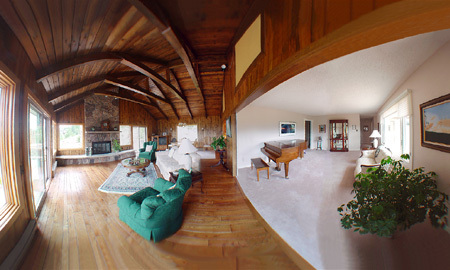 This panorama was made up of 5 separate fisheye lens images, using techniques that are based in large part on photographic methods Jeffrey R. Charles developed in the late 1970's. © Copyright 2002 Jeffrey R. Charles, All Rights Reserved. The Umbra Approaches Mazatlan, Mexico. Each panorama is made up of a series of four photos taken with a Nikon FM camera and a 16 mm f/2.8 fisheye Nikkor lens. The North photo is repeated at each end. 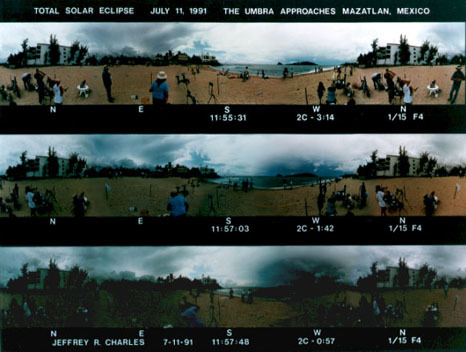 In order to facilitate taking panoramas in an expeditions manner during the eclipse, Jeffrey R. Charles designed and fabricated a remote control indexing rotary camera platform, which was subsequently marketed by Versacorp as the Versarama (TM). The motirized platform allowed each panorama to be taken in less than six seconds. Copyright 1991, 1997, Jeffrey R. Charles, All Rights Reserved. The Umbra Engulfs Mazatlan, Mexico. 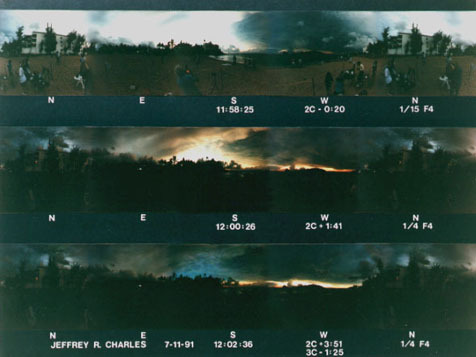 Each panorama is made up of a series of four photos taken with a Nikon FM camera and a 16 mm f/2.8 fisheye Nikkor lens and the motorized indexing rotary camera platform. For information about licensing these images, other images at the Versacorp and EclipseChaser web sites, or Jeffrey R. Charles' unpublished images, please contact Versacorp (license *at* versacorp.com). Prints and electronic files of Jeffrey R. Charles' images and published papers are also available for sale. The rest of this web page is Under Construction. Copyright 1991, 1997, 1998, 2002, 2004 Jeffrey R. Charles, All Rights Reserved.